Except for the exclusion of Georgia from BCS bowl game (rules! ), I believe the lineup could provide some very entertaining games. I really like the exposure of OSU in San Antonio vs. Texas….much better than had they gone to the Holiday Bowl in San Diego. IMO the Fiesta Bowl (big vs. fast) could be the best game of all, but the Cotton Bowl could be the most exciting! Fiesta: Oregon vs. Kansas St.
Rose Bowl could be very disappointing. Wisconsin really 3rd place in their division, but tOSU and tPSU are ineligble. Then Nebraska blows out four tires in the Big10 championship game. Wisconsin in with 5 losses. Between Wisconsin going to Pasadena for the 3rd straight year (fan fatigue) and Stanford's lack of fan support, RB tickets should be pretty cheap on Stub Hub this year. For you Huskies fans (I know there are a few of you around), you can kill two birds with one stone. The Las Vegas Bowl is the same weekend the Pilots are playing at the Orleans. Football at 12:30, Pilots Basketball at 7:30.
blacksheep wrote: For you Huskies fans (I know there are a few of you around), you can kill two birds with one stone. The Las Vegas Bowl is the same weekend the Pilots are playing at the Orleans. Football at 12:30, Pilots Basketball at 7:30. I understand Johnny Football, Texas A&M redshirt freshman Jonny Manziel has won the Heisman Trophy beating out Notre Dame’s Manti Te’o and Collin Klein of Kansas State. Good for Johnny; it would appear he’s a worthy recipient. But is the Heisman most hyped, overly publicized and romanticized individual award in sports? Is the public interest in the award far less than the broadcast minutes and print inches devoted to its discussion? I’ve heard those questions posed, and the answer to both questions is probably yes, but so what? 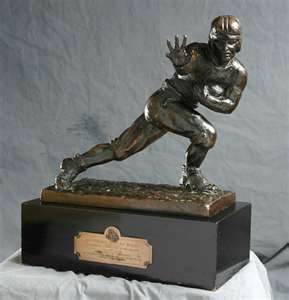 The Heisman has a very rich history, and for an old guy who vividly remembers the days when Howard “Hopalong” Cassady, Billy Cannon, Terry Baker, and John Huarte won the award, I’m sure there are millions more young people will have their memories of Cam Newton, and now Touchdown Johnny Manziel to look back upon when they post on PilotNation 50 years from now. A guy named mattywizz once told me that the Heisman is the award for the best quarterback or running back from a ranked BCS school. Or something like that. I specifically remember him ranting, "It's not a career award!" Well, at least this year we don't have to call it a career award. pilotram wrote: A guy named mattywizz once told me that the Heisman is the award for the best quarterback or running back from a ranked BCS school. Or something like that. I specifically remember him ranting, "It's not a career award!" Oh, it's definitely NOT a career award....Terry Baker is a prime example. I watched eight of Baker's games in 1962 live (there was NO TV), and I've only seen Manziel on TV against Alabama, but for that game he was VERY impressive. I look forward to seeing him again in the Cotton Bowl on January 4th. At that same very moment were you trying to argue that Jason Gesser would be a worthy recipient of the Heisman? mattywizz wrote: At that same very moment were you trying to argue that Jason Gesser would be a worthy recipient of the Heisman? They took him off the grain elevator and put him in the barn (aka Kibbie Dome). Um, I guess Texas fans are thinking more about the Alamo Bowl than about their basketball team. Somehow I missed this, but a week ago Notre Dame Coach Brian Kelly was named the Sporting News Coach of the Year; congratulations Coach Kelly. I also heard that "technically" Coach Kelly did not receive the most votes......that honor went to "Anybody but Alabama Coach Nick Saban," but I don't know if that's true. I thought his Coach of the Year Award should have been shared with the Pitt field goal kicker. And the Oregon field goal kicker. Stonehouse wrote: And the Oregon field goal kicker. If Oregon went undefeated, I think Brian Kelly still gets coach of the year. Oregon's successful season was expected. ND was unranked to begin the year, and running the table squeaking through their schedule undefeated was totally unexpected. DoubleDipper wrote: YGTBSM! Georgia is not selected for a BCS bowl?? But Norhtern Illinois is selected?? Whatever bowl gets Georgia is going to have one fine team, and fine game. #6 Georgia getting past #23 Nebraska 45-31 in the Capital One Bowl was a very good game. The Northern Illinois loss to Florida State in the Orange bowl was not. In fact, that was the most boring bowl of the day….and I saw them all. up7587 wrote: Rose Bowl could be very disappointing. Wisconsin really 3rd place in their division, but tOSU and tPSU are ineligble. Then Nebraska blows out four tires in the Big10 championship game. Wisconsin in with 5 losses. Despite poor fan attendance at the Pac-12 Championship Game back in late November, Stanford alumni and students have flocked to Pasadena for an impressive turnout. Last Friday school officials stated that Stanford has sold 38,900 tickets, more than twice the number of tickets that Wisconsin has managed to sell. Last season Stanford also sold out its allotment of 17,500 tickets for the Fiesta Bowl. Stanford’s win over Wisconsin seemed like a real turn-back-the-clock game with Barry Alverez on the Badgers sideline. The game itself was good, just not real exciting in the second half as Stanford finally prevailed. I think the best game of the day was the non-BCS matchup between Georgia and Nebraska in the Capital One Bowl, but he most exciting finish had to be the Outback Bowl where South Carolina came from behind to beat Michigan with a passing touchdown with 11 seconds to go. Good to see Northwestern beat Mississippi St. in the Gator Bowl to finally win a bowl game after a 64 year hiatus, and a nine bowl game losing streak. Sorry, but the Oklahoma St. vs. Purdue Heart of Texas Bowl (really! ), it looked like the convicts vs. the pocket protector geeks....you can decide which was which. I would call #21 Louisville's win over #3 Florida in the Sugar Bowl tonight VERY satisfying. Florida has been crying for the last month about how they should be in the BCS C'ship game against Alabama, not in JUST the Sugar Bowl. Well, perhaps they should, but based upon my first time watching them this season, I'm surprised they were considered a Top 20 team, let alone #3. And to make it even more satisfying, Florida’s players acted like thugs much of the evening…..yea, I enjoyed their loss. DoubleDipper wrote: I would call #21 Louisville's win over #3 Florida in the Sugar Bowl tonight VERY satisfying. I listened to the Texas coach last week saying how the current bowl game system “benefits” the players….really, Mack? How? While Coach Brown went on to pocket his bonus check for beating OSU in the Alamo Bowl (Chip Kelly will reportedly earn a $250,000 bonus if UO wins the Fiesta Bowl), players are limited by the NCAA to gifts valuing no more than $550. I no longer think bowl games are for the fans either. I once regularly attended various bowl games around the country on my paltry government salary (the bowl depended upon where I lived at the time), but it is no longer affordable for most of us considering the cost of airfare, accommodations and tickets. If the current bowl system were truly for the fans and players there would be a FBS level playoff system in place like in FCS D-II and D-III, with the participating players actually earning a pay check for risking their health for school pride. As we know, poll voters and computers pick the contestants in the BCS Championship Bowl; in 2014 it will be determined by a committee as the NCAA changes to a thinly disguised extension of today’s bowl system. If the NCAA football champion is to be determined between the sidelines, and if the NCAA is to truly honor the players and fans, not just the coaches, it should adopt a 24 team playoff system. Let the bowls bid for the “final four” and pay the participants from all the money the bowls reap. There wouldn’t be the empty seats you see now, and it would closer to fair for the players. When Chip Kelly moves on to his millions of dollars in the NFL…he’ll leave behind a great number of young kids who helped him get there….and all they’ll have to show for the help they gave him will be aches and pains, and perhaps a state school education. DoubleDipper wrote: I listened to the Texas coach last week saying how the current bowl game system “benefits” the players….really, Mack? How? I was on board until you started ripping my state school education. I get sick of people suggesting that we should pay players. This is not professional sports. I know there is big money involved (Chip is the highest paid state employee, and it's not even close), but it would ruin college sports to pay players. Do you really think that Northern Illinois could afford to pay its players the same as FSU. Small colleges would be left out completely. Yes, the players give a lot to their schools, but the schools give a lot to the players too. Some of these kids might not even get into school if it wasn't for sports, and many more would fall through the cracks if not for the support system the athletic department gives. A college education (even at a lowly state school) has real value to the kids that make the most of it. Plus, lets be honest, these kids are playing a sport! If I had the talent, I would have loved to play college football and would even have paid my full tuition to do it. blacksheep wrote: I was on board until you started ripping my state school education. Hmmm, a little sensitive about the state school thing, blacksheep, but then who can blame you! I agree that NIU could not match money with the BCS schools, but my lament was about the structure of the bowl system as it exists. It is NOT my suggestion that players be paid a salary, but rather they share in some of the "spoils" not limited to gifts not to exceed $550. (Two former Rose Bowl players I spoke with immediately sold their "swag" so they would have cash for car insurance and gas). Further, my argument was for a true playoff system that would determine the champion between the sidelines instead of in a bowl committee boardroom overseen by the NCAA. Love your passion...."I get sick of people suggesting that we should pay players," but that argument was not the intent of my post. DoubleDipper wrote: I no longer think bowl games are for the fans either. I once regularly attended various bowl games around the country on my paltry government salary (the bowl depended upon where I lived at the time), but it is no longer affordable for most of us considering the cost of airfare, accommodations and tickets. Much cheaper than spending the day in the casino or at the Spearmint Rhino! blacksheep wrote: Much cheaper than spending the day in the casino or at the Spearmint Rhino! Hey, and quit piling-on, will you? I haven't seen this much of Colin Klein's wife since I saw this much of Brady Quinn's girlfriend. Tonight, in the Fiesta Bowl, was the first time I've seen Kansas St......it's hard for me to figure how they were once rated #1 and ended up as high as #5. They reminded me of Florida in the Sugar Bowl; big, but not all that talented. If the Fiesta Bowl win was Coach Kelley's last game at UO....he's left a fine team on the field, let's just hope he hasn't left a fine mess for the NCAA to discover.